DETECTIVES MAKE AN ARREST IN THIS CASE. INFORMATION OBTAINED BY COMMUNITY MEMBERS AFTER MEDIA RELEASE. After releasing this story to the media and public on February 14, 2018, SAPD Robbery detectives received numerous tips leading to the identity of the suspect in this case. 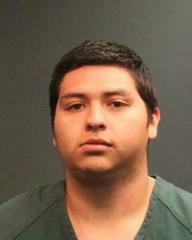 The suspect was identified as Rafael Rodriguez Jr. residing in the City of Bellflower. With the assistance of the Los Angeles County Sheriff’s Department Criminal Apprehension Team the suspect was arrested at his residence in the City of Bellflower. SAPD detectives obtained a search warrant for the suspect’s house and located evidence linking him to this crime. Suspect was booked into Santa Ana Jail for the following charges: robbery, kidnapping for robbery, false imprisonment and assault with a deadly weapon. Without the assistance of media and community members detectives may have never identified this suspect, and this case may have gone unresolved. Suspect: Male, Hispanic, 22-28 yrs, 5’7” tall, 160 lbs, short black hair, medium complexion, tattoo on right forearm, wearing a black t-shirt, gray sweatpants and black shoes with white soles. Suspect Vehicle: Newer model red Toyota Camry or similar four door sedan. On 2/12/18, at 10:53pm, the suspect entered a business located in the 3700 block of W. McFadden and assaulted the victim. The suspect pointed a semi-auto handgun at the victim and demanded money. The suspect then struck the victim on the head several times with the handgun while pulling her hair. The suspect violently attacked the victim and strangled her while preventing her from escaping. The suspect fled the location after the victim gave him an undisclosed amount of U.S. currency. The victim sustained substantial injuries to her face and head as result of the attack. Anyone with information is asked to contact Detective Greaver at (714) 245-8362 / DGreaver@santa-ana.org or OC Crime Stoppers at 1-855-TIP-OCCS.